It was an incredibly high energy time, celebrating our New Age lifestyle and coming face to face with our individual karmic patterns, learning from them and letting go so that we could share and serve in a totally trusting relationship. I marvel when I look back at those days. Our many accomplishments, with little or no previous experience, were inspired by Allen Michael’s expansive vision and the freedom we felt to be our creative selves. As we performed our music, ran restaurants, published books and cared for our many children, our focus remained on our mission of publishing and distributing Allen Michael’s channeled writings and getting “the Comforter” before the people. It was clear to us that we were being guided by Creation Universe. We recognize ourselves as the “church of God rising among the people,” making “Michael’s stand with the holy people,” Dan. 12:1-4, and in 1973, we became chartered as the Universal Industrial Church of the New World Comforter. We were granted a non-profit status, with Starmast Publications and Productions as the publishing and production facet of the church. With past secretarial experience, I was naturally led to participate in the publication of Allen Michael’s channelings – a highly fulfilling endeavor, as well as a great challenge. It was rewarding to be able to use skills I had acquired as a secretary in the wage slave world toward something I truly cared about. Those of us who have worked on the publications have learned to trust that the supernal truth will shine thru in spite of it all and have strived to edit the messages coming thru as little as possible. 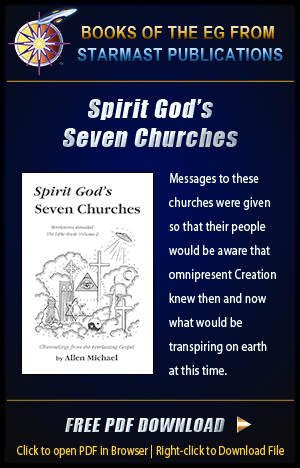 Allen Michael channels from an all-encompassing perspective of the Synthesis, explaining the relativity of all things on this world, which in the written form can be easily misinterpreted inasmuch as most of the words in our language are a reflection of limited thinking and duality. Out of ignorance of the truth, the fear of the unknown blocks people from being open to something they have never heard of before or read in their text books. It’s of course absurd to imagine that the books supervised by the establishment would have any truth about the economy and history, when their purpose is to program the youth to fit into the backwards system and keep the wheels turning in the so-called government and in giant corporations. 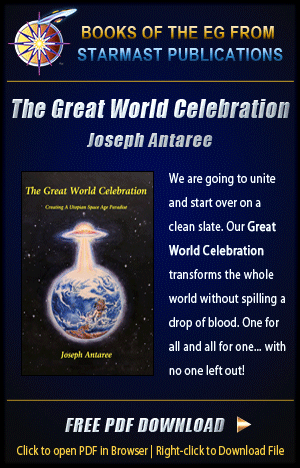 However, at this time in the year 2011, the planetary transformation into our wonderful new sharing world is rapidly approaching, and the consciousness is expanding, as more and more people are recognizing the truth. Galactica has allowed the negative effects to build more intensely now in planetary catastrophies to awaken the people from their dream, or I should say “nightmare,” of buying and selling Creation’s abundance for secular gain. Back in Berkeley, at last, the great day came that we had been looking forward to. 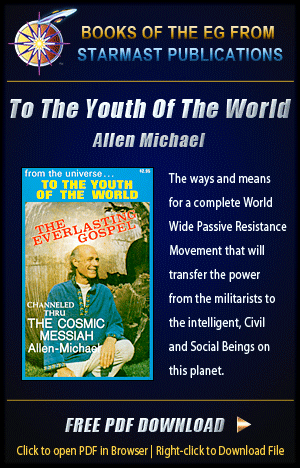 It was June of 1973, and as Starmast Publications, we published the first book of the Everlasting Gospel series, “To the Youth of the World.” Just as many other times over the years, that was one when we were all sure that this was the big breakthrough and, with our mission at last accomplished, we were soon to be recognized for the truth we were bringing to the people. I realize that “soon” is relative, and it’s always the same day in the Universe. Now, 39 years later, I can see that it was just one of the many publications, videos and talks over the years, containing the message and being recorded in the collective consciousness for this time now, when the rising planetary consciousness has reached a point where the truth of the Everlasting Gospel is being recognized. 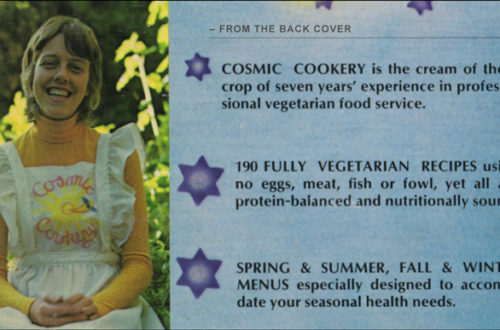 Following the publication of the first EG, we published our natural food cookbook, “Cosmic Cookery”, thanks to Kathryn and Lorena’s competence and stick-to-it-iv-ness as editor and artist, along with the support of all the communal members who carried out the necessary daily activities to keep our visionary starship moving ever onward. As a result of Cosmic Cookery’s popularity, we published three additional printings, and Kathy had many opportunities to display her charisma and share the wisdom of a natural food diet. Under Chris Plant’s leadership, a small group from the Family set up a communal project in Sacramento where we operated the One World Family Natural Food Restaurant on the K St. mall. We got the word out in the State Capitol, serving many people, including then governor Jerry Brown as an occasional customer. Toward the end of ’75, with the demand of editing, publishing and promoting the EG and putting on musical productions, it became evident that the all-consuming responsibility of operating the One World Family Center in Berkeley was no longer feasible. As the older and more experienced members were being pulled to communication projects, we were unable to maintain our food service on the same high standard, and the Center wasn’t making it financially. Then, one day we were faced with the news that the two former fraternity houses we were living in on Prospect Street had been sold and our large family had to find other dwellings. With perfect timing, shortly before we were to move out of the houses, Allen Michael found a buyer for our restaurant. It was the end of an era and we were being moved on our way, just as we had been led from San Francisco to Marin to Berkeley. 1974 was a year of emissaries going forth to establish projects on their own. First, Jay, Tama’s husband and a friend of the family, helped set up a OWF natural food restaurant in Lahaina on Maui, and Tama, Michael B., Bill B., Elaine, Betty, Sheila, Jeanie, Joe, and others went to beautiful Maui to communally operate the Cafe Paradise. Our little restaurant on Front Street was a big success, and subsequently, we opened the FarOutfits Shop also on Front Street. It was a beautiful little shop across from the ocean, where we sold our handmade, airbrushed clothing and gifts. In that same year, Steve, who had gone on the road with his band, wanted to establish a musician’s commune in Eugene, Oregon and asked Michael and me to come there to help set it up. We agreed to make the move, welcoming the opportunity to be together with Mike, Rhys, Catie and Chris in a closer relationship than had been possible since joining the commune. Having been swept off our feet with the idealism and vision of a world of caring, sharing people, living as one family while going thru the myriad of changes that accompany so radical a change in lifestyle, we had been blind to the fact that our children needed a lot more individual attention and care than they were getting, and the move gave us the opportunity to do that. The two months we had planned to be in Eugene flew by and became two years. Michael studied radio communications at Lane Community College, where he became a student Senator and, even though he was recognized as having some unusual and radical ideas, was chosen to attend a Community College conference in Washington, D.C. We participated in many fairs in Eugene and did our usual promotions to get the word out, with people joining us for different periods of time. On one of my trips to Berkeley for a visit, I learned the art of airbrushing from Bill B., and when I returned to Eugene, I set up an airbrush studio in our house. I found that not only was it a good chance to get our literature to the people, but as well, selling flying saucer T-shirts at the Saturday Market – a popular arts and crafts marketplace downtown – was a great weekend cash flow project. Michael and Rhys expressed their creativity in woodwork and weaving by making and selling Inca looms and beautiful hand woven belts, while Catie and Mike helped with the booth. Beldon came up from Berkeley to join us, and during our last two months in Eugene, we took over a bakery that was going out of business. It was a great time, baking our honey pastries and Whole Wheat Sunflower Seed Bread in the beautiful, large professional bakery and having the opportunity to provide our natural whole grain pastries and bread for the community. It was short but sweet, and after operating the bakery for two months, we had to move out because the owner went into bankruptcy. We realized then that it was time to return to the Family’s newly acquired home base in Stockton. Following our move from Berkeley, members had found temporary living quarters in various areas while the Family searched for affordable housing large enough to fit our needs in the land of separate family dwellings. Because we had the small group of the OWFC operating a vegetarian restaurant near the Capitol in Sacramento, we included that area in our search. Thus, we found the beautiful Wong Mansion in Stockton, 45 minutes south of Sacramento, located in the San Joaquin Valley. Stockton has the distinction of being a multi-cultural area, with a deep water port on the San Joaquin River, surrounded by fertile delta farmland. The low cost-of-living and the slower pace was a welcome change from Berzekly for all of us, particularly for those of us with children. By the time we returned from Eugene, Allen Michael and some of the communal family members had made the move to the Wong Mansion, which we renamed the Altamira. It was a beautiful oasis in an older, multi-ethnic neighborhood of small houses. The 12 bedroom mansion was built above street level, with large grounds containing many different kinds of fruit trees and surrounded by a beautiful wrought iron fence. On the adjacent property, we rented a three-apartment complex with a large swimming pool. As more of the family reassembled, we rented three additional houses within a block of the mansion and, on that same block, had an organic vegetable garden on a large lot donated by our landlady. Stockton was quite a contrast to the radical, fast-moving scene in Berkeley, and without the vast drain of energy it took to operate our large Center on Telegraph, we were able to develop other areas of creativity and communications, as well as publish two more books of the Everlasting Gospel series, “UFO-ETI World Master Plan” and “ETI Space Beings Intercept Earthlings”. Along with publications and promotions, our other “Creative Schools of Experience” included a productive woodshop, sewing, airbrushing, candle making, tie-dying, video and music productions, recording, catering and organic gardening, most of which were included in our Children’s Schools of Experience. The high point of this period were our musical productions, with leading musicians, Bill B., Bill H., Andor, Leaetta, Alan; Patti and Bill’s dancing and teaching abilities; the genius of Betty’s costume creations; Elaine and Joy’s sewing skills and, of course, the participation of all of us other talented members of the family. We provided most of our own entertainment and recreation, and the weekly family disco parties in the Meditation Room were gala celebrations, hosted by our own “Disco Daddy,” Bill B. We had our little self-contained environment, learning thru the doing while we produced our inspired art, music and books. It was a wonderful world, free of the insecurity that comes of the secular world of buying and selling, wheeling and dealing. Of course, we all had our different karmic patterns to unravel, and living communally is a speedy way to learn about yourself and to make changes. If you can’t make the changes, you have to leave, and when you know there is nowhere else you want to go, you do it. In looking back at where I was at then, I can see how much I’ve grown in self awareness, and I’m so thankful I’ve been given this opportunity to awaken more and more to my true self – a continuing process for all of us here on this healing project planet. In early 1980, Michael Parry came up with the idea that we form our own political party and he drew up the papers for us to register as the Synthesis Party, “the party to end all political parties and have a real party!” – with Allen Michael running for president in the ‘80 election. On one of his promotion trips to Southern California, Beldon succeeded in setting up a date with the producer of the Real People show. At that time, Real People was a popular CBS-TV show out of Hollywood. The show’s director, Chuck Hillinger and host, John Barber, came with their crew to document our dynamic communal demonstration. The crew had planned to spend half a day with us, but they were so interested in each person they interviewed, the spirit of our wonderful lifestyle and the colorful surroundings of the Wong Mansion, that they extended it to two full days of interviews. It was an exhilarating experience, with all of us turned on to the wonderful story we have to tell and the thrill that we were finally going to be seen and heard. This was a few months prior to the 1980 presidential election and Allen Michael made an agreement with the producer that he would not appear on any other national TV show before the election, which meant canceling a scheduled appearance on the Tom Snyder Show. It was another of those peak times when world recognition appeared to be eminent, and had CBS shown our demonstration of living together as one family on national TV, we most certainly would have had world attention. But of course, the ruling powers wouldn’t want that, and we probably would have attracted a lot of negative energy to ourselves from the establishment. I can see now that the consciousness at that time wasn’t ready for the truth of so great a scope and the coming changes. Month after month, we were told that the showing had been delayed for one reason or another, and ultimately, it was never shown! 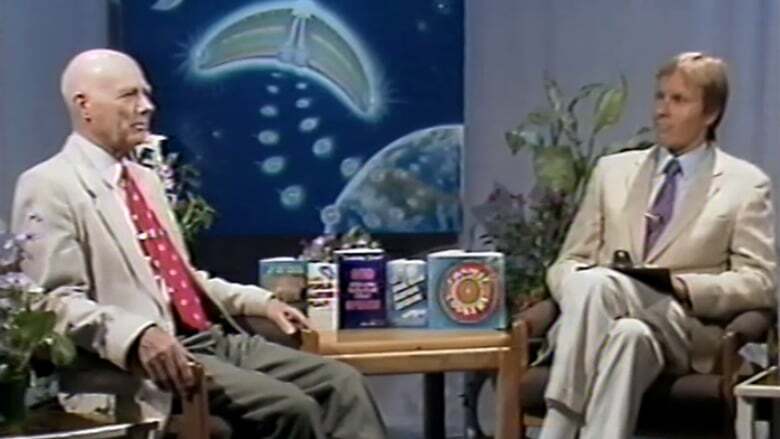 It was obvious to us then, just as it has been obvious all along, why no major network has yet covered our fantastic demonstration and the enlightening messages coming thru Allen Michael from Galactica. The “money behind the throne,” who control the mass media, couldn’t let people see how wonderful life can be when people are sharing all things in common and serving one another without thought of reward. It might blow all the brainwashing that’s been done to portray communism (communalism) as an evil, sinister force. The truth is that it is the powers-that-be of the usury money world who represent the evil force – but then too, it’s all relative! As our children grew, we could no longer have three or four sharing one bedroom as we did when they were smaller, and as well, the older children were being harassed in the neighborhood. So, we began to move in smaller groups to another part of Stockton. It was an interesting transition – living in the world of separate houses. For several years, we continued to maintain our communal structure and alternated dinners at the different houses during the week. We experienced the truth of the old saying, “It goes with the territory,” as we were brought face-to-face with the secular programming that goes along with that lifestyle of separate households, where people are caught up in the day-to-day status quo business-as-usual cares of the world and its inherent fear of survival. We no longer had communal cash flow projects that our maturing youth could participate in, which is one of the reasons that many communal members began to spread out and integrate back into the community’s economic and social structure. Little by little, different members of the Family went off separately and in small family groups to experience life once again in the buying and selling world. Because of resentment and feeling alienated, after graduating from high school our son, Michael, chose to leave the communal group and “make it” in the status quo world of effects. Since then, he has had many of the same unfulfilling experiences and problems relative to money and relationships that the majority of people experience in that world. However, with his beautiful high spirit, he has made great strides in overcoming old conditioning. Now, even people with relatively happy childhoods and those who have become “successes” in the status quo world are beginning to realize that there is something very wrong with the way we, as a humanity, live on this planet and that there is a great need for a total social change. 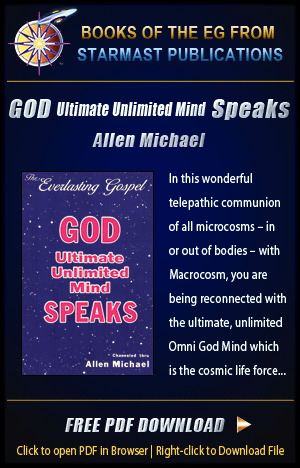 In November of 1982, our publishing facet, Starmast Publications, published the fourth of the Everlasting Gospel series, “GOD-Ultimate Unlimited Mind-SPEAKS”. Allen Michael felt that the place to be to reach the most people with our latest publication was the Nation’s Capitol. At that time, Thera was in New York attending a UN meeting, and from there she went to Washington where she found a large furnished house that was to be available for rent two months from that time. This was the publication date of the fourth Everlasting Gospel and the exact time we had planned to be in D.C. Once again, synchronicity! Michael and I went to Washington to prepare the house ahead of the others who were to follow with Allen Michael. I had the same feeling of exhilaration when we arrived there as I did when I was eighteen and first arrived in San Francisco, the home of the catalyzing energies of the Flower Children. The Nation’s Capitol is a beautiful, dynamic city, no doubt a result of the high energies recorded there by the vision of the Founding Fathers of a government of, by and for the people. Theirs was the vision of the new world – the world of life, liberty and the pursuits of happiness for all people, born equal, with free cash flow money as guaranteed in Article I, Section 8, Paragraph 5, “Congress shall have the power to coin [and print] the money and regulate the value thereof.” This is the key plank of the U.S. Constitution, which was to bring freedom from the Old World Bankers and absolute freedom, security and abundance, equally for all. But we can see how that old satanic energy took over entities who brought in private banks and usury money, so that the cornerstone as shown on the one dollar bill wasn’t laid for the New World at that time. Allen Michael, Michael B., David, Joseph, Jeff and Amra joined us in our big house, a block from Connecticut Avenue near the D.C. Zoo. Very shortly, we became acquainted with the more enlightened people of the community who, we were pleasantly surprised to find, were more receptive to our lifestyle than any other community we had been in previously. The media, however, was more establishment-controlled than we had anticipated and in spite of our many interviews and on-going promotions, we received little press or TV coverage. This, of course shouldn’t be so surprising since the Nation’s Capitol is the “heart of the beast,” the headquarters of the money changers, and we were hitting a little close to home. All things being relative, it was a good experience and more seeds sown. Washington is a beautiful city of high energy, and there was a feeling that reminded me of the Flower Children era in San Francisco, with people becoming aware of the changes that must be made in our society. The hills, the trees, the Potomac River, the historic houses and neighborhoods, the monuments and the large African American community, all add a richness and uniqueness to this special city, and of course, it is the world headquarters of the Luciferic powers-that-be. The nation’s Capitol has been cited as one of the worst, relative to environmental and social problems. Just as in the other large cities, the negative effects of the system, with the people unable to build and maintain their environments the way they should be, are building to the point of no return. The money system keeps the people from being able to have their public services, roads, streets and buildings built and maintained on one high standard for all, and the homeless fill the streets in growing numbers. It’s the negative prod to progress as antithesis and thesis come up against one another, ultimately to come together into the synthesis – the new world of equality and sharing. I was attracted to the African/American community, for their warmth and unity of spirit. As a result of the negative effects of the usury money system, they were uniting together to improve their own lives and the lives of their children in ways that are now beginning to happen in more of the middle class white communities. The big mistake many African Americans and other minority groups in this country make, is that they place the responsibility on the “white” race and on the Zionists for their plight as the underprivileged. It’s not only that those of all minority groups are at the bottom of the stack in the usury money getting-for-self world. It’s the money system that’s to blame for bringing about the cause for prejudice in the first place. The inequality and fear of lack are a direct result of the getting-for-self usury money system of haves and have not’s. When the planet’s abundance is shared equally by all as one family, there will be no fear of lack, or its effects, prejudice, greed and jealousy. In spite of not getting the coverage in the major media we had expected, we sowed a lot of seeds with our books and literature and made many friends. One of them was Barbara Carpenter, who had founded the Network of Light. She had been inspired by the communal experience she had at Findhorn in Scotland and had brought together many harmonious spiritual new age groups to share together in recognizing the truth of One. We participated in the yearly Heart To Heart Festival and enjoyed many communication gatherings with the Network of Light, as we shared our vision of the New World. After we’d been in D.C. about a year, we felt it was time for our small group to get back to California. My son, Rhys, came out and took over management of our house on Garfield Street, and for the next 14 years he managed it as a group house for university students. Allen Michael and the rest of the crew returned to Stockton, except for my husband, Michael, who chose to remain on the East Coast. I went on to our commune in Maui to spend a few months before returning to California. Before my trip, I had no particular expectations about the Hawaiian Islands and was pleasantly surprised to find Maui to be a heavenly place, the reason the Hawaiian Islands are called “paradise.” The OWFC had rented two houses, side by side, on Front Street in Lahaina, and I moved into one of them with Joy and her son, Jivan, and when Joy left the Island, I moved in with Elaine in the house next door. Elaine was managing our FarOutfits shop, which was also on Front Street, with the beautiful Pacific Ocean right out our front door. There was a high vibe among the tourists, who were all happy to be in the land of Aloha, and it was an enjoyable experience to sell them our beautiful clothing and gifts from the Islands. I airbrushed shirts for the shop and had a wonderful time becoming familiar with our tropical paradise. I had been in Maui for about a year when Elaine felt it was time to reestablish on the mainland and I was ready to get back to our communal family. So I helped close up shop and returned to California. 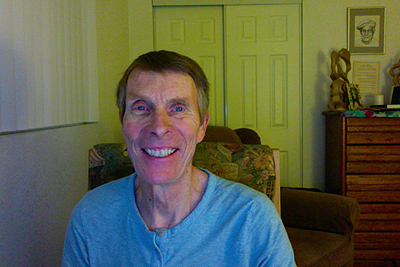 I rejoined our group in Stockton, where we continued to produce videos for public access and editing, publishing and promoting the Everlasting Gospel and AllenMichael. In 1993, the two groups of us in Stockton and Sacramento moved to Sonoma County, where some of the former communal family members had relocated. We occupied a house in Windsor and one in Santa Rosa, where we are now. 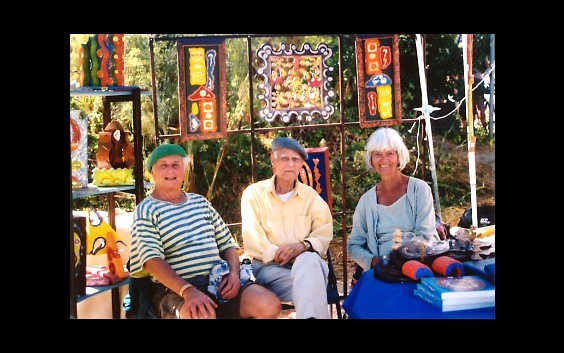 Over the years, for various reasons, members began to go back to separate living in the world of buying and selling, to the point now where there are four of us older members in the Commune. Although we no longer live communally with the many members of our once large group, we still recognize each other as kindred spirits, and we share a bond in the recognition of the truth that Allen Michael channels from Galactica. Since the “Flower Children” days in the Haight/Ashbury, we have watched many spiritual and higher consciousness groups come into vogue, and now, every aspect of the status quo “business-as-usual” lifestyle is being questioned by the New Age youth and young-at-heart. We have observed the growth of the natural food movement, from the time when our little Here And Now restaurant on Scott and Haight Streets was the first vegetarian restaurant in San Francisco, our Mustard Seed, the first in Marin County, then, The One World Family Natural Food Center, the first in Berkeley, and now, even the big food processors are getting in the act. The consciousness has been rising in all areas, leading to the great wake-up to a beautiful free world of sharing and natural living. In our new world, the Garden of Eden, all environments will be beautiful, with baths, gardens and fruit orchards near lakes and streams, rivers and oceans. As the children grow, they will be with their peer groups, learning from the older children in our creative “Schools of Experience,” growing food and flowers and caring for themselves and their environment. The children’s natural abilities and inspiration will no longer be held back by being fed status quo belief systems that program them to fit in and keep the wheels turning generation after generation for the buying and selling big business system. Everything will be produced according to the highest standard of esthetics, as we provide food, clothing, beautiful environments, care, recreation, transportation, communications, energy and all creative arts for one another. True happiness comes in sharing together in creative endeavors and in sharing equally the abundance of the planet, freely given so lovingly by Creation. All things will be done in the joy of doing, creating, sharing and serving. Never will any fault be found, nor judgment made, but all will help, love and lift one another according to need and ability. People all over the planet will be living together harmoniously as one family, sharing the joys of all babies and children together, with no concept of possession of person, place or thing, no fear of loss and all needs provided. All people will feel the same loving bond for one another that parents and children feel for one another now, as we recognize that we truly are One. Our children are all-knowing entities of the Universe and no longer will be restricted and molded into the acceptable status quo cog to fit into the man’s backwards lifestyle and conditioned to go into the military murder factory to be shipped off to kill and be killed. The people have been in a duality consciousness of good and evil, while their higher knowing – their spiritual awareness – lies dormant with walls of words that have been programmed into our computer mind bank to set off feelings of fear of an imaginary enemy, of lack and of death. We can be glad now that this is all ending. As we look at our planet we see sorrow, anger, pain, destruction and death all around us. These things are not part of Creation Nature. In the evolving consciousness, we have brought about these negative effects ourselves and have become hypnotized to the point of believing that they are all an unavoidable part of life. Now, in the third millennium of our time-keeping system, we are awakening to the very simple truth of it all. The truth is that we indeed are one humanity on a planet of abundance for all to share as one family. Those of us who have remained close to Allen Michael and pursued publishing, video production and speaking engagements to bring the Everlasting Gospel to the people, are of one mind in the knowledge that Allen Michael was the entity chosen to fulfill the prophecy spoken by Jesus in St. John 14:16, 26 and 16:1-13, the Comforter Spirit of Truth. He is the Galactic Being who was previously incarnated on this planet called Hermes and has brought the Everlasting Gospel, which heralds the coming world transformation. We are part of the symbolic 144,000, the “elect,” here at this time, awakening to our true Being and our role in the coming New World of absolute freedom, security and abundance for all. When I look back to the sixties, I feel in awe of the change I made in my life, going from a housewife with a husband and four young children in suburbia to a communal Hippie in the Flower Children’s Haight/Ashbury. It was like I had awakened to a colorful dream, filled with music, singing, dancing and laughing children and, of course, the inevitable ups and downs that go with the territory. I knew I had at last found the real thing. Now I can see that we did as much as we could at the time. With the energies the way they were, had we continued to grow, we would have become a big threat to the establishment and would have brought down a lot of negative energy on ourselves. We had recorded the New World way of life, heaven on earth, and that stage of our mission was recorded in the morphogenetic field, there to spread over the whole planet when the time is right. We recognize ourselves to be a church in the true meaning of the word – a group of people who have come together to live according to our highest ideals for the betterment of humanity. We are channels, just as those who are channels of the arts, computer science and technology and those entities who channeled the Scriptures in the many holy books of the world, the true meanings of which have been perverted and misconstrued by mortal mind – a consciousness in duality, subjugated to materiality. The marvel of it all is that right here in our midst has been the Being all the world prophets down thru the ages have told would come. 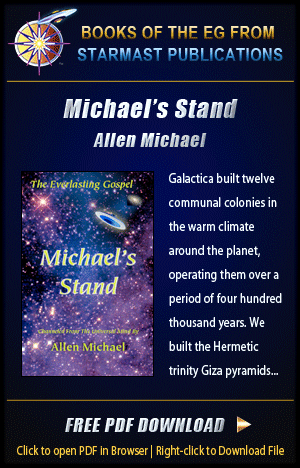 In this incarnation, the reason this entity has been called Allen Michael, is because he channels the Archangel Michael energies of the Galaxy and is fulfilling the prophecy of “Michael’s stand,” Dan. 12. 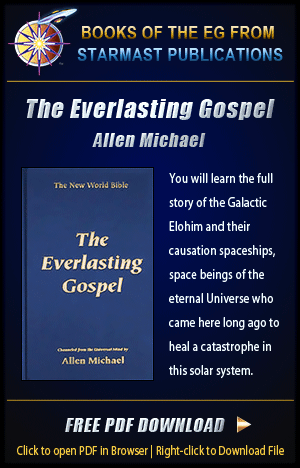 Allen Michael reveals the truth of prophecy and the many things that haven’t been revealed before about this planet and this solar system. For those who are ready, it rings as clear as a bell. Allen Michael passed away at age 93 in 2010, leaving four of us, Jeff, Michael, Barry and I, together in a large house. Joseph, his wife, Tera, and sons, Timothy and Luke, live separately here in Santa Rosa. Beldon, our dome builder, comes and goes and is ever present. David has been living in 29 Palms for several years, where he promotes Allen Michael and the EG. Built with Joseph’s great assistance, we continue to operate and update our main website, the Galactic Messenger Network — so beautifully created and maintained by Dale “Deej” Lafayette of AME Studios, an extended member from our Berkeley and Stockton days. Now, as the consciousness rises, there is a proliferation of books and teachers of higher awareness coming forth. The greater truth is being revealed in words and deeds in so many areas all over the planet, at the same time, the negative effects in wars, starvation, disease, death and planetary catastrophes are increasing. As the energies rise to come into the synthesis, enough people will recognize the truth and be able to balance out those who are taken over by paranoia and fear of change. It’s the end of the usury money system and all of its negative effects, war, crime, disease, poverty and planetary catastrophes, the negative feedback (satan’s pitchfork) that has been necessary for the transcendence of consciousness back into one for all and all for one. The recognition is rapidly growing, with the tremendous rise in consciousness that began back in the high energy days of the 60’s and increasing with the building negative effects all over the world. 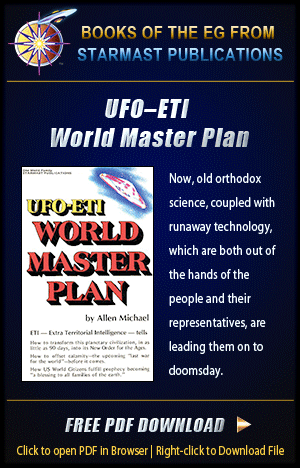 The truth Allen Michael has brought to the prophecy in the Bible is becoming more and more evident for all to see. This was great reading. I lived in Lahaina in 75 and loved the Cafe Paradise. The tables were set within a bunch of banana trees. All the hippies in Lahaina ate there. I still use the One World Cook Book. It was while using it that I got interested and checked out where you guys were. It was fun to read this story about the group. Bravo! Del, you really nailed it right on the head. My honor to have shared so much of it with you, Allen Michael and everyone. What an unbelievable crew, what a life!! An abundance of creative talent and energy in revolutionary service to a new world. 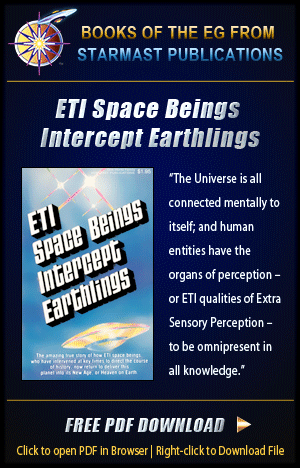 And what a channeling, from the EG down thru the daily details, ETI is omnipresent with us and in us. I am a first cousin of Steve Wolfe, whom I believe was a member of this group. I never got to know him but would like to know more now. Anyone who would care to share stories? I know he was an accomplished musician. My, My, What a great feeling in my heart to know that I have found something of interest in this world again. I’m intrigued to find a belief I have felt all my life but was too supressed to succeed. I hope to make this a new beginning. I am ready! Let those unknowing learn, share & develop. Hi Mark, It’s always rewarding to hear from a kindred spirit. Where do you live? I’d be happy to send you an EG if you’d like. You all might remember me and my husband Christopher Cross. Our daughter Crystal was born while we were living in one of the Berkeley communal houses. 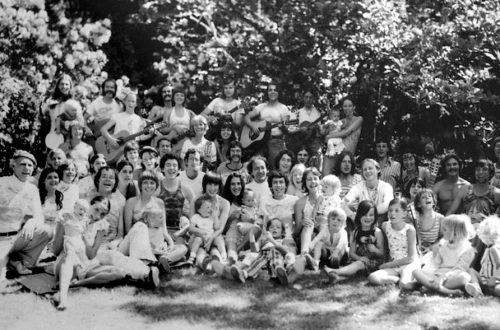 I am in the picture of the family from 1973, immediately to the right of Allen Michael. I think about all you you and was glad I found this web page. Sorry to hear about Allen’s passing, but he did live til he was 92 and he certainly had a long rich life! I live in Amsterdam, Holland now with my Dutch boyfriend, but if I have a chance to visit any of you that remember me I’d love that. Please get in touch with me through my email if you’d like to reestablish a connection. Best of luck to you all!!! GREAT ARTICLE!!! Brought back so many awesome memories of those days in Berkeley, the restaurant, peoples’ park and all the wonderful times I shared with everyone in the family for the years I was with you guys! Hope you are all doing well. Loved reading the history of One World Family. I lived in Hawaii in ’75, and learned airbrushing from Debbie and Michael. I lived with them in Sunset Beach on Oahu. They would take me to Maui to help work in the store. I was in Lahaina recently and looked for the location, but it has changed so much. Great memories! Hello to Debbie and Michael!